We are honored to have been recognized for our role in five projects which received 2012 Maine Preservation Honor Awards for restoration, rehabilitation and adaptive use including the adaptive use of the Twitchell-Chaplan Co. Building at Merrill's Wharf. 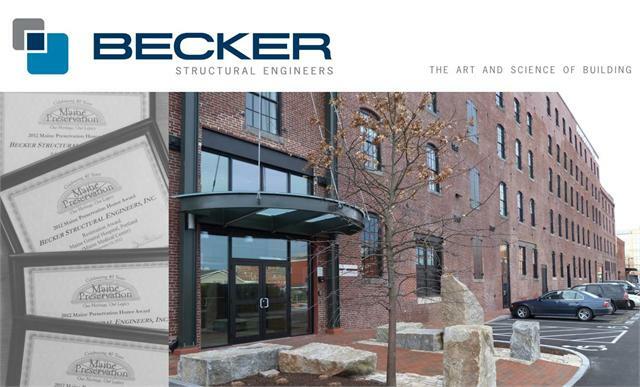 In collaboration with Winton Scott Architects, Becker Structural worked closely with mason Knowles Industrial Services to develop and employ strategies to stabilize the aged brick masonry. Other recognized projects included the adaptive use of the Healy Asylum also with Winton Scott Architects, the rehabilitation of Maine Hall at the Bangor Theological Seminary with CWS Architects, the rehabilitation of Hedge & Roger Williams Halls at Bates College with JSA Inc. and the restoration of the exterior envelope of the original Maine General Hospital building at Maine Medical Center with design/build partner Consigli Construction Co., Inc. Photo courtesy of Winton Scott Architects. 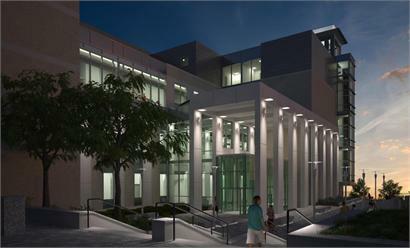 Becker Structural worked integrally with PDT Architects to generate a fully coordinated REVIT model for the new $40 million Augusta Court Facility, due to open in 2015. The design team facilitated an early release foundation and structural steel package to meet the accelerated construction schedule so that Construction Manager Consigli Construction Co., Inc. could break ground in 2012. The 120,000 GSF building will provide 4 levels for courthouse functions over one level of below-grade parking. An elevated pedestrian bridge will connect the new facility to the adjacent historic Kennebec County Courthouse. Check out a fly through of our structural REVIT model.Rendering by Architectural Image Solutions, courtesy of PDT Architects. Perched on the banks of Newburry Neck, the views from this residence, currently being constructed by MK Construction, are framed by a narrow channel leading to views of Cadillac Mountain and Acadia National Park. Becker Structural is proud to be working in concert with Elliott + Elliott Architecture and Michael Boucher Landscape Architecture on this project where the aggressively tight site has emphasized the need for a seamless relationship between building and landscape. 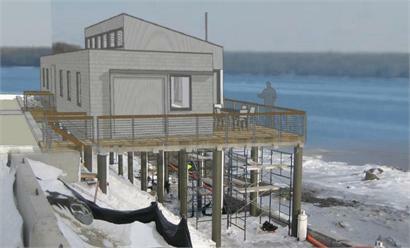 Rendering courtesy of Elliott + Elliott Architecture. Embracing new technology can be a daunting task, especially under a tight deadline. But as Ethan's experience can attest, it's more than worth the effort.